Heat oven to 350°F. Spray bottom only of 13x9-inch pan with cooking spray. Drain pineapple, reserving liquid. Reserve 3/4 cup pineapple tidbits for topping. In large bowl, beat cake mix, remaining pineapple tidbits, 3/4 cup of the pineapple liquid, the oil and eggs using spoon or rubber spatula 1 minute. Spread batter evenly in pan. Top cake with whipped topping; spread evenly. Just before serving, top with sliced strawberries, sliced banana and the 3/4 cup reserved pineapple tidbits. Drizzle with chocolate syrup. You can use sweetened whipped cream in place of the whipped topping if you like. Make sure you use pineapple tidbits and not pineapple chunks for the cake. A surprising number of ice cream cake recipes don’t even include actual cake. They’re just recipes for ice cream that is molded into a cake-like shape. The audacity! 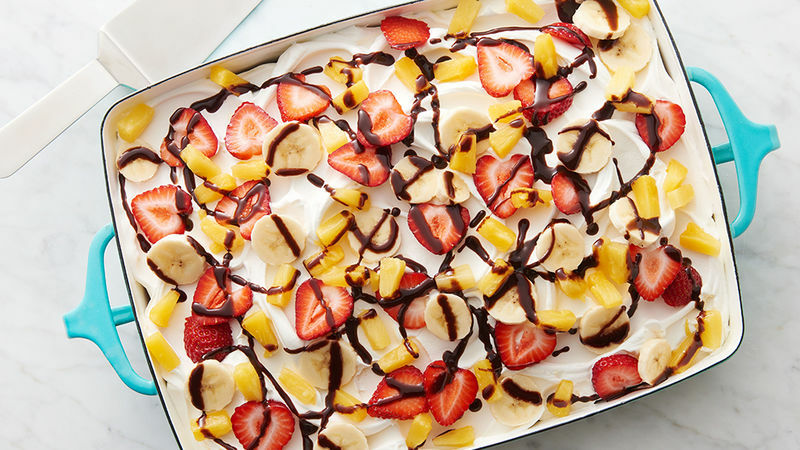 Our banana split cake recipe has actual moist, baked-in-the-oven cake plus ice cream, so you get the deliciousness of both all in one bite. Here are other cake recipes you’ll want to sink your teeth into.